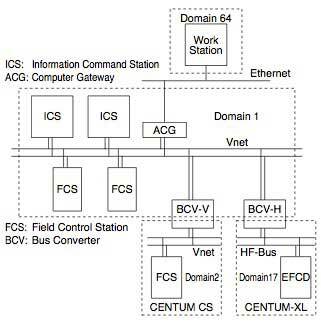 This paper introduces the technical merits of V-net, which was developed as a control communication bus for the CENTUM CS distributed control system. To guarantee and realize the aforementioned high rate of operation, high reliability, and real-time operation at low cost. Vnet is a control communication bus incorporating the three concepts above that has been developed in consideration of the following two concepts and is used with the CENTUM CS. To maintain a real-time processing ability with an increase both in communication and connected stations. Also to make it easy to connect two V-nets and another control bus such as an HF bus. To improve compatibility with another system, such as a workstation or a personal computer These technical items are explained hereunder. Figure 1 is an example of the system architecture in CENTUM CS. A domain is a range through which a token passes, and communication can run without bypassing the bridge and gateway. Unique numbers in the system are assigned to respective domains and each station is determined only by the domain number and station number. Logical domain numbers can be also assigned to a group of stations on a medium other than the V-net. In this way, integration of a number of plants and the construction of a hierarchical structure in a large plant can be carried out definitively, and a station on the V-net can communicate with even a control station on an HF bus. Likewise, a workstation on the Ethernet4 network via the same V-net interface. Process data are accessed through the logical name (tag name plus data item name) of the data and floating data in engineering units so as to prevent interference with the intrinsic database structure of the station. To preserve the security in an open interface, the system bus checks whether or not to access data. To double-check for an incorrect operation, the system bus checks the validity of a set data value and the set time. The link transmission function provides a transmission and reception interface like a global switch for data shared by all the stations in the domain. Each station broadcasts its link data (up to 2 kbytes) to the V-net at a fixed interval (100 ms) and the reception process for the link data is performed by the hardware without interrupting the software. The received link data are saved in the alternate buffer provided at each transmission station and can be accessed from an application at the same time even during reception of the link data (see Figure 2). A checksum is added to the link data so that the reliability of the data is guaranteed. In a conventional system, time management is carried out by each station. Therefore, if the time is not adjusted periodically by the user, a time lag between stations may result. CENTUM CS has a clock inside the V-net controller and automatically synchronizes the time between the stations via the V-net. Stations in different V-net domains synchronize their time with the time master in each domain respectively. The bus converter monitors time lags between the domains and can synchronize the time in a domain on the time reference side with that in a domain on the opposite side and synchronize the time over the domain (see Figure 3). If the time master fails, there is a risk that all the times in the system will be out of synchronization. Therefore, each station periodically makes a self-diagnosis for the time function. If an error is detected, the station prevents acquisition from the time master immediately thereafter. If an error occurs in the time master itself, it gives up its right as time master. A message is sent with an alarm that there is an error in the time function. To allow real-time communications, we employ a token-passing system. However, should the number of stations or communications increase, degradation of performance due to the time for the token to make a round cannot be avoided. CENTUM CS requires 10 times as much communication as CENTUM-XL. Points carried out by the V-net to reserve a sufficient performance as a CENTUM CS control bus are described later in this paper. The transmission speed is set to 10 Mbps (10 times that of the HF bus) and the number of stations that can be directly connected is set to 64. The maximum frame length is set to about 2 kbytes, and the amount of communications per frame is set to about 10 times that of the HF bus. The overhead required for a frame process when the amount of information increases is regulated as much as possible. If the time it takes a token to make a round (average of token transfer times between the stations) is set to 30 μ s or less, a high response trend one digit different from that of the HF bus is obtained. Even if the transmission speed is increased to 10 times that of the HF bus, the actual transmission capacity will not increase 10 fold generally due to restrictions on the actual frame process time and the transmission delay time. In the V-net, a communication controller has been developed with a large-scale ASIC, and data link control is possiblewhile receiving a frame, and the hardware is optimized so as to maximize the speed of the token's rounds. This part is the most important point technically. As a result, the number of token rounds per unit time increases and sufficient performance can be ensured even if the communication load factor is high compared with the HF bus. A large-scale ASIC plus ROM has been developed for the communication control circuits with data link control and part of the application function so that the number of parts, failure rate, and cost, are decreased, and the mounting area is reduced. Parity is added to the data bus and a check facility is also provided in the data interface with the CPU so that various failures can be detected. To discover a failure early, the communication control circuits periodically make a self-diagnosis for interruption, ALU in ASIC, the address setting switch, memory, and communication interface, and they detect a failure due to the watch-dog timer and periodic interruption also from the CPU. The physical layer is duplicated and even if the cable or coupler of one of the buses fails, continuation of the normal communications is guaranteed. The two buses are always used alternately and if a communication error occurs, the bus is switched to the other bus to execute retransmission. If one of the buses fails, the V-net broadcasts the bus status information, updates the status management table called a live-list, and continues communications with the normal bus thereafter. 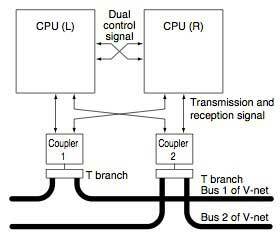 At the same time, the V-net executes TDR, specifies the faulty part (cable or coupler position) of the bus, and broadcasts the information so that a countermeasure can be easily taken if a bus error occurs. The station detecting a failure of one of the buses periodically communicates via the faulty bus. If it is successful, the V-net judges that the bus has recovered. Therefore, the time of failure of the one bus is reduced remarkably compared with the HF bus by mounting and unmounting that bus so that easily recoverable buses are obtained. Even if the cables or couplers of both buses are removed at the same time (duplex failures) due to an error in the station addition procedure or an unexpected failure, the hardware detects the status and when the cables or couplers are connected once again, the buses can be returned instantaneously. Even a station structure where the lengths of the cables between buses 1 and 2 that are restricted in conventional systems are extremely different is unrestricted. The performance, dual management due to redundancy, failure diagnosis, and detection function have been greatly improved. When joining the network, whether there is already a station having the same address as that of the self-station is checked to prevent the existing station from being disturbed and whether the bus architecture of the self-station is the same as that of another station is checked to prevent the cables from being wired incorrectly. A CRC is added to the frame, the data quality on the circuit is guaranteed, the frame length and a checksum are added to the frame, and the data quality from end to end between the stations is guaranteed. Two types of checksums, such as a checksum for the header which is used for data link control and a checksum for data division which is used for an application to keep the data check away from missing data, are provided. The communication control circuit always monitors the collision of carriers in the communication circuit and prevents the occurrence of multiple tokens, the time of occurrence of which is unknown. A sequence number is added to the receiving frame and if the same data are received repeatedly by retransmission, the receiving frame returns a response but discards the received data to prevent the application from considering the data. To prevent data that are to be relayed by a bridge from cycling continuously in a large network, a relay step counter is installed on the frame and if the count exceeds the relay point limit, the extra data are discarded. To facilitate network management, maintenance information is collected. Collection of maintenance information from another station, the dumping of memory, and tracing of the communication frame can also be executed easily so as to make maintenance, which is generally difficult, easier. Hardware maintenance commands, such as start and stop of another station, that are realized by the HF bus are also supported. The CPU of each station periodically diagnoses the communication control circuits, such as loopback, and checks the soundness of communications from the CPU to the communication cable. A station like an FCS having a duplexed CPU is redundant with the structure shown in Figure 4, and online maintenance in each unit can be carried out. The station addresses on the control and standby sides are managed by the same address, and the station is configured so as to prevent another station from considering dual-redundancy. To guarantee the soundness at the time of a switch, the station on the standby side periodically performs a diagnostic operation independent of the station on the control side. It seems that the role of communications in DCS's will increase more in importance. We intend to develop high-response, high-performance products in the future that retain the reliability of today. S. Takigishi; "CENTUM CS System Architecture," Yokogawa Technical Report, No. 18, pp. 1 to 4 (1994) CENTUM is a registered trademark of Yokogawa Electric Corporation.